17 과: 가족이 몇 명이세요? 나... 우리 가족은 모두 넷이에요. 아버지와 어미니가 계시고, 형이 하나 있습니다. 가... 철수 씨는 대학생이지요? 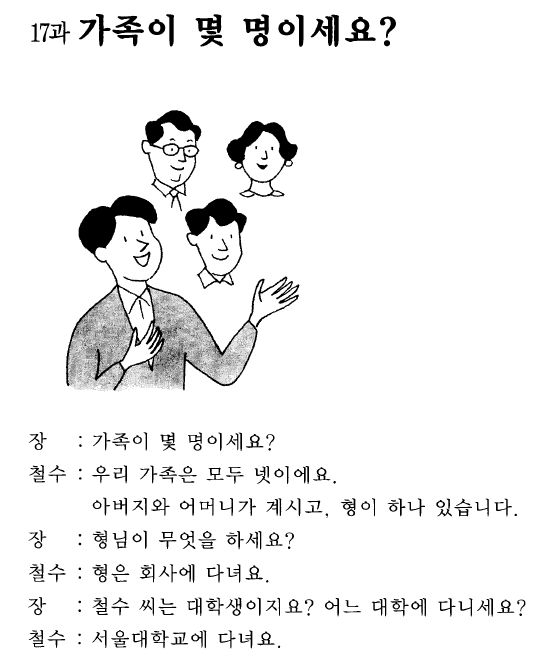 어느 대학에 다니세요? Unit 17. How many people are there in your family? A... How many people are there in your family? B... My family has 4 in total. There are father and mother, and 1 older bother. A... What does your brother do? B... He works for a company? A... You're a college student, aren't you? Which university are you attending? B... I study in Seoul National University. 1. N-이에요/예요? : Are you ? /Is he? - He is my friend. - There are total 5 people. This is not the 2nd flood, it is 3rd floor. 2. N이/가 -(명)이다. : There be (people) N.
교실에서 학생들이 모두 12 (열두)명이에요. In the class, there are total 12 students. 4. N-(이)지요? : aren't you?/ isn't it? It's 9:00 now, isn't it? - Yes , it is. 6. N-님 : N+ honorific ending. That person is teacher Park, right? 아주머니 세 분이 모두 오섰어요. All 3 of the women came. My older brother works for company. 1. 분 is honorific form of 명.
E.g In restaurant, waiter asks "멏 분이세요? ", and customer answers "네 명이에요." 2. -(이)세요 ending is politer than -(이)에요. 3. -(이)지요 is a "polite informal speech" ending. 4. Korean means 우리가족 as my family. The same as 우리나라 (my country). 5. -님 adds respect to the title.